It’s impossible to standardize strength training for any group of individuals. There are simply too many acute variables to take into consideration. Each of us have our own unique set of circumstances which are as varied as the human landscape. However, there are movement patterns and strategies we can employ which will move us into a safe and effective evidence based strength training program for the off-season. The best way to organize a strength training protocol is to break it up into phases of training. This is similar to a periodization scheme. The first phase we could call the STABILIZATION PHASE which will last between 3-6 weeks depending on the organization of the athletes season and level of conditioning going into this phase. The athlete should start this phase within ten days of their last race. There are many schools of thought on how to organize strength training programs. In the coming series I chose to organize the training into 3 phases: STABILIZATION (off-season), STRENGTH A/ STRENGTH B and a MAINTENANCE (in season) protocol. For a multitude of reasons I will be omitting a true power/plyometric phase though I will integrate some elements of it in the next two series. 1. Conditioning the muscle fiber and soft tissues at the myotendonous junction (where muscle and tendon connect). 2. Habituate the body to eccentric (force reduction), stabilization, and concentric (force production) phases of movement. 3. Enhance ranges of motion through multiple joints and bodies of tissue. 4. Enhance the neuromuscular systems ability to maintain a stable working posture on a changing base of support (balance). 5. Generally prepare the body’s systems for increased demands/loads in the STRENGTH PHASE (second phase). Its important to remember that endurance training is repetitive and mechanical by nature. Throughout the course of an athlete’s season there’s an accumulation of thousands upon thousands of individual repetitions in a limited range of motion occurring in one plane. A great example of this is cycling, where the athlete performs thousands of pedal strokes in a fixed plane (hips in the saddle and feet clipped into the pedals with force directed in a very linear way). Since tissue remodels along lines of stress, the effected joints and tissues become very strong in a limited segment of the continuum thereby destabilizing the joints which are designed to move through multiple planes and ranges of motion. All of this increases the risk of injury for the athlete as they are unable to effectively reduce, stabilize, and produce forces dynamically in all planes and ranges of motion as the joints are designed to do. In the stabilization phase of strength training, we aim to slow the tempo and focus the action on reducing forces (deceleration of load or movement), and stabilizing with neuromuscular control (neuromuscular or motor control refers to the effective interplay between the nervous system and the muscular system to produce postural equilibrium under load or in a state of transition). Typically there is less use of external loads than there will be during the true strength phase (phase 2). Many of the patterns rely on body weight (intrinsic load) or light loads with bands (elastomers) and dumbbells, or medicine balls. It takes time to strengthen the tissues and joints in the body. Muscle fiber responds to loads relatively quickly whereas soft tissues (tendons and ligaments) take more time, because they are avascular (have reduced or no blood flow) and elastic. This means they require additional time to hydrate and regain their elastic and tensile properties. *Always utilize a SYSTEMATIC progression scheme. Start with light loads, progressing them logically and systematically. Begin with few repetitions (6-10) of particular pattern or exercise and advance them in a rational way. There should never be large percentage jumps in loads. *As a rule of thumb, don’t increase loads by more than 5% (certainly never more than 10%) and only after you can perform the desired amount of repetitions of the original weight with no trouble for 2 sessions. 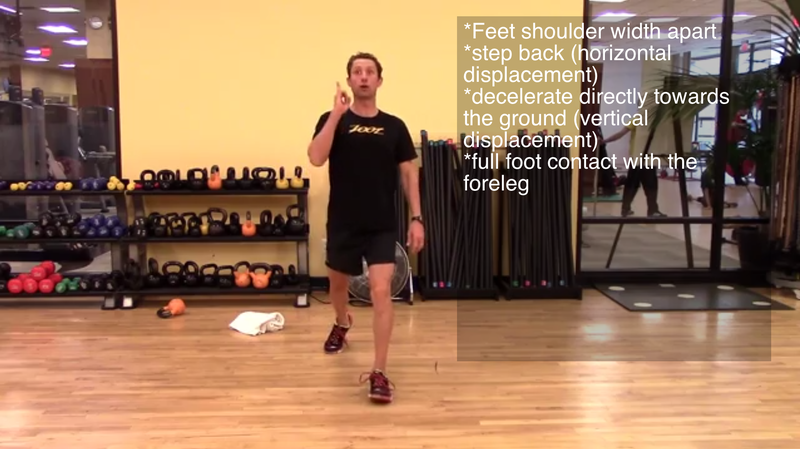 *It’s important to move towards single leg patterns which will enhance the stability of the low leg and foot. So much movement and force comes from the ground up for runners, the pedal up and hip down in cyclists, and swimmers rely on the foot for “pop” off the wall and propulsion at the end range of the kick. Strengthening the musculature of the low leg is important for any endurance athlete. *Set/Repetition organization at the onset of this phase should be 3 sets of 8-12 reps per exercise. 2 secessions per week is plenty. An intelligently designed strength training program is one of the best ways to become stronger and avoid injury. Achieving optimal performance on race day is the cumulative effect of all the “other” things we do besides the aerobic workouts. It’s about making time to get to the gym or clear a space at home to do the strength work which will make you a better athlete downstream. Here is a playlist containing a sample workout for an offseason/transition-stabilization oriented strength protocol. Take: 30-:60 between each exercise (less is fine). Move through the exercises as a circuit of 4. Performing #1,#2,#3,#4 and then back to #1 until the first circuit of 4 has been completed, then move onto the second group (5-8). 1. Reverse Lunge: Perform 3-4 sets of 8-12 reps per leg. 2. Quadruped/Bird Dog: Perform 3-4 sets of 8-12 reps per side in an alternating fasion. Maintain a stable base of support.Seated 3. Row: Perform 3-4 sets of 12-16 reps. Use a weight which will allow you to perform the repetitions. 4. Crab Walk: perform 3-4 sets of 10 steps per direction/leg. 1. Plank with Abduction: 3-4 sets of 8-12 repetitions per leg. In the beginning, a simple plank WITHOUT the leg movement is adequate. 2. Single Arm Chest Press on Ball: 3-4 sets of 12-16 reps. Keep the range of motion comfortable, getting as much range as you can. 3. Prone Cobra: Get through 3 sets of 8-10 reps. Keep the movement comfortable, never forcing the range of motion. Hold the position for :02-:03. 4. Single Leg “V-Up”: 3-4 sets of 8-14 repetitions per leg. Alternate OR go unilaterally. Please contact me with any questions or if you want help with and individualized protocol. This article was also published on TrainingPeaks.com.